Delta Airlines had an amazing deal on tickets from Raleigh/Durham to Barcelona, so Tootie, our friend Maxine, and myself bought tickets for late September to spend five days in Barcelona. 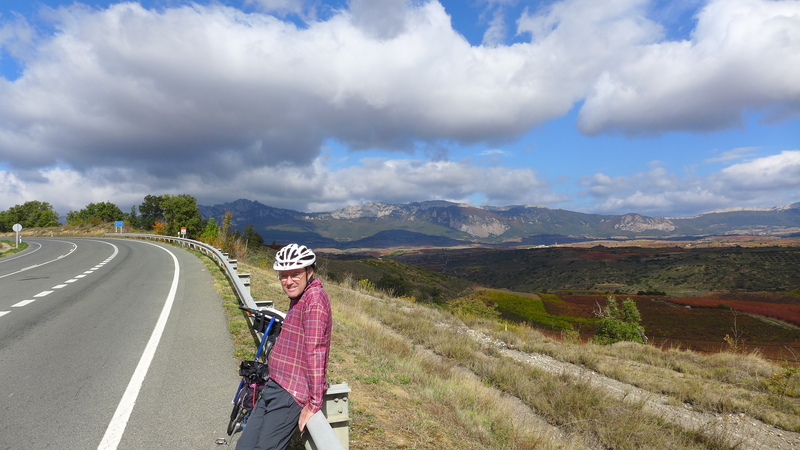 I added six more days to the trip to do some bicycling by myself in rural Spain after Tootie and Maxine went home. Our friend Nancy who is also from North Carolina and works for American Airlines joined us in Barcelona. For our time in Barcelona we arranged a two bedroom apartment from Airbnb. It was in the Gracia neighborhood two miles from the old town. It had a balcony that overlooked the street. Over five days we did a lot of eating and drinking and visiting some of the major attractions of Barcelona. I particularly liked Park Guell, which is a circa 1910 failed real estate development; only two families actually built houses there. The unique public buildings for the anticipated community were designed by the famed Catalan architect Antoni Gaudi. It is now a crowded public park and recognized serious work of art. We had bought tour tickets in advance. In our five days in Barcelona we walked around the city. We had drinks on a rooftop terrace. One day we took the commuter train about twenty miles south to Sitges, a medieval beachfront town now quite touristy with a sizeable gay community. We had a nice open air lunch and then walked on the beach. Spanish and Catalan food is fundamentally honest. In this entire trip hardly anything seemed prepackaged. The whole country seems to eat food that is cooked from real ingredients. I saw one chain restaurants the whole trip. Restaurants are also generally a real value even in a big city like Barcelona. Thirteen Euros for a three course meal includes tax, tip, and wine. This Barcelona restaurant had an old school decor and specialized in the food of Bilbao. Nancy and Tootie got fricando, a stewed beef akin to pot roast. We left Barcelona on Friday. Tootie, Maxine, and Nancy were set to fly back to America and I had a train ticket leaving Barcelona station at 7:30 AM, taking me four hours west. 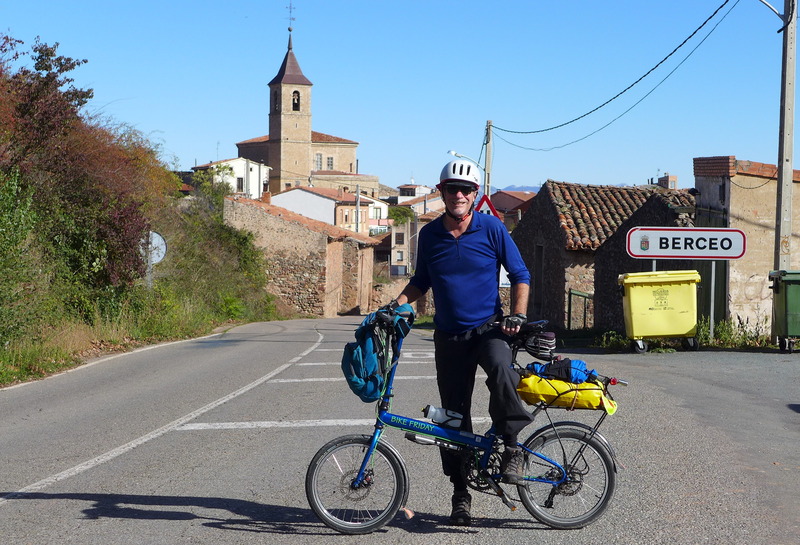 Navigating a big city on a bicycle is difficult, so I chose for the start of my bike ride, pretty much at random, the small town of Altsasu, fifty kilometers west of Pamplona and 538 kilometers from Barcelona. Altsasu was at a high elevation so any bike ride from there would likely be downhill! I had not completely planned the return, but I knew that after six days of cycling I would take some kind of train back to Barcelona for my flight home the following Thursday. At six-thirty in the morning I kissed Tootie goodbye and rode my bicycle three miles through the dark streets of Barcelona from our apartment to the Sants train station. I would take the folding bike with me on the train. Hardly anybody was on the streets at that hour. The train ride was fine. When I got off in Altsasu about noon I was somehow reminded of the scene in Butch Cassidy & the Sundance Kid, where the protagonists are let off the train in the middle of nowhere, in their case Bolivia. After the train pulled away and I was standing there solo, the silence of the rail yard of Altsasu was palpable. No one was around except for one old man sitting in the station. He wanted to know all about my bicycle. I pulled the bicycle together and headed off. I went into the small town, stopped at a bar for a cafe con leche, and then proceeded down the highway. My destination that day was the city of Pamplona, about thirty miles to the east. I was in the province of Navarre, but apparently a lot of the people in this area speak Basque. The architecture of the Basque towns looks vaguely Swiss. There were political statements on some of the buildings. After a couple of small towns, I passed this place. A lot of people seemed to be eating there, so I stopped for a three course lunch. The main course was these delicious stuffed peppers. While a lot of highway signs were in the Basque language, the menu in the restaurant was in Spanish, and everyone in there seemed to be speaking Spanish as well. I got into Pamplona late in the afternoon. A city of about about two hundred thousand, its outskirts consist of nondescript apartment blocks. It took a few turns, but I eventually found my way into the old city. On one side the city wall still exists. Notice the bicycle path on the left, going up the hill. Once inside the older part of the city, the density is dramatic. I found a room at what looked to be one of the fancier hotels in the older part of the city and the price was still only about seventy-five Euros. I chilled in the room for a while. Walking around later Pamplona had wonderful street life. On this Friday night there was a free jazz concert in one of the main squares. I watched the music for a while and then walked around looking for tapas. Every block in the downtown area had several places, all seemingly full of people. The weather was perfect so people spilled outside. The street often felt like a room. This butcher shop was still open, ham is sold sliced directly from the hoof! I did not know how to choose which bar to go to. One place seemed to have a lot of people my age (old!) who might have discerning tastes. Standing at the bar I got about six different kinds of tapas and two glasses of wine. One, this “sandwich”, looks plain but when made with amazing bread and amazing ham, it tasted revolutionary. Clearly, Pamplona was about ham (jamon!). I walked around and took more pictures, then went back to the hotel. The next morning at the bar of my hotel, cafe con leche and tostada com jamon (coffee with milk / toast with ham) was the breakfast of champions. Over the next three days I was bicycle to and stay overnight in three small towns. I rode out from Pamplona that morning. Getting a route out of the city towards the northwest was confusing. At one point I followed a guy on a racing bicycle who was riding on a near-freeway for a mile or so. I followed our route on my map phone and it made sense; there was really no other way out of town in that direction. Once outside of the city the scenery was dramatic and there was not much traffic on the two lane highway. I decided to get off the main highway and take an even more scenic route, which included going through the small town of Aoiz. Getting into town I heard some explosions so loud I thought there might be a terrorist attack. People on the street seemed unconcerned. I discovered some kind of festival a couple blocks away in the center of town, and this included fireworks (at eleven o’clock on a Saturday morning!). Many people were dressed in some kind of costume. In my typically uncommunicative way I never found out the name of the festival, or what it was celebrating. The town of Aoiz fronts a small river. Google maps directed me across a bridge and then onto some very small roads. This was all peace and tranquility until the road turned into gravel, which is bone shaking on my bicycle’s skinny 100 PSI tires. I eventually ended up back on a regular highway. Because the Spanish eat lunch so late, on this trip I tried to do most of the bike riding before lunch. My destination this day was the town of Sanguesa. I got there about two-thirty in the afternoon. I immediately starting looking for somewhere to eat lunch. Yelp is not always helpful in Spain, but I would not have found this place without it. Despite being in a remote small town, this was probably the best meal of the entire trip, and at twenty-five Euro, the most expensive. Centered back from the street, the interior had a cozy cave-like feeling. It reminded me that food quality often is about presentation. First course was asparagus with mayonnaise, egg, and tomato. Second course was grilled lamb chops with potatoes and roasted peppers. I am sure dessert was delicious but I cannot recall what it was. After dessert, there was, of course, coffee. I needed lodging. I found a room on the edge of of town at a motel on the highway. The owner was gregarious. The interior was filled with references to Catholicism. I walked back into town at dusk. It was Saturday night. People were hanging out on the street. The next morning I had breakfast at the hotel and cycled off. I first went through a valley. The road then turned uphill towards the town of Sos del Rey Catolico. I learned on Wikipedia that the town was only named “Sos” until not much after the year 1452, when future king Ferdinand was born in Sos while his mother the queen was temporarily living there during a war. They soon added “del Rey Catolico” in the king’s honor. The road climbs up to the promontory where the town is located. The “roads” of Sos are too narrow even to bicycle; I parked the bicycle where apparently locals park their cars and walked up the stairs into the town. I spent a few minutes walking around. It was too early to eat lunch so I continued to bicycle uphill. I pedaled uphill for a least three or four more miles in the mountains before cresting. From that summit I would be going mostly downhill, eventually ending up in the river city of Zaragoza three days hence. For this day my map showed that it was a sizeable distance until I got to the next large town, my intended day’s destination of Ejea de los Caballeros. The highway descended down the mountain. I was hungry and tired when I pulled into Ejea sometime after two o’clock. 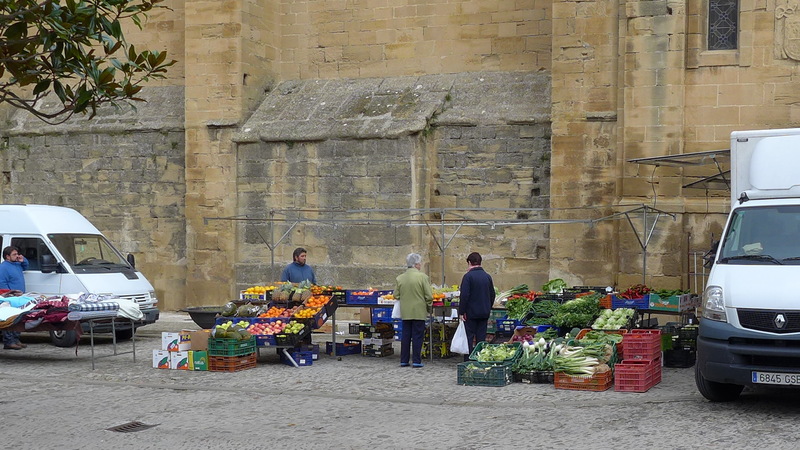 In contrast to other place I had been in Spain, on this Sunday afternoon the town seemed lifeless. There was a working class feel to the place. Typically in Spain there are about four times as many bars as actual restaurants. I looked on Yelp and biked around but I had trouble finding somewhere where people were actually eating. I finally saw a place with a lot of motorcycles parked out front. As in the USA, Sunday seems the be the day for organized motorcycle rides; a lot of them had passed me on the highway. These people were clearly a club. Underneath their leather outfits they had matching T-shirts with their names on them. For most of the meal the only patrons of the restaurant was the motorcycle club and me. Note that on the guy with the bandana’s jacket are sewn the words (in English) IRON HORSE BORN TO RUN. There was no written menu, the server described the first course choices and called this simply “garbanzos.” This soup was much more than that; garbanzos and vegetables in a complex broth with ham. Second course was steak and fries and a roasted pepper. I could see through the window where the motorcycle people had gone outside outside to leather up; my bicycle was parked next to them. I needed somewhere to stay. The older part of town was uphill on a bluff, I found this place on Google Maps; about half a mile from the restaurant. The owner was so helpful and friendly it made me vaguely uncomfortable. The room was in a very old building but renovated with modern features. I think I was the only guest. Later on I walked back down the hill and sat in a square, watching the world go by and reading my Kindle. On the roof across the street this bird stood there stoically; I had always heard of storks in legend and in books but I had never actually seen one. The next morning I biked onward, finding some back roads across the landscape. I passed through a series of dusty towns. In one town I stopped and got a cafe con leche and a truly delicious pastry. The town looked less pleasant, and after reading and enjoying my coffee, I continued on. The front room was a bar. Behind it was a “comedor” or dining room. The only other people eating there were seated at a large table; guys who clearly worked together. First course was salad with asparagus. Second course was grilled salmon. I did not specify what I wanted for dessert and they pretty much gave me everything: peach, whipped cream, flan, and ice cream cake. The eleven Euro price for lunch included wine. Since no one else was drinking white wine, they gave me the whole bottle, as much as I wanted to drink. I looked at the label, the wine came from a place about ten miles from the restaurant. As you might imagine, even with all the bicycling I gained about three pounds during this trip. After the long lunch I staggered back through the bar. These guys were playing cards. I got on the bicycle and headed downriver, passing through more small towns. I got as far as the town of Alagon and got a room in the Hotel Los Angeles. This is the view from the hotel window. There were lots of people hanging out at the pleasant space in front of the hotel, most of whom did not seem to be staying there. I sat out front for a several hours, reading my Kindle. While this clearly is not a wealthy town I liked its vibe. I ate a late dinner at the hotel, as well as breakfast the next day. It was all a great deal. 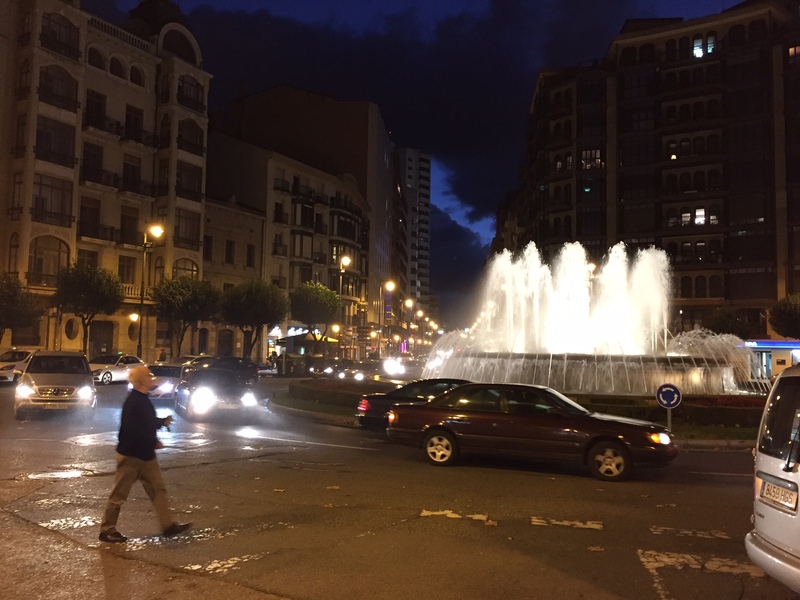 My destination the next day was the city of Zaragoza, population six hundred thousand. From there I would take the train back to Barcelona. 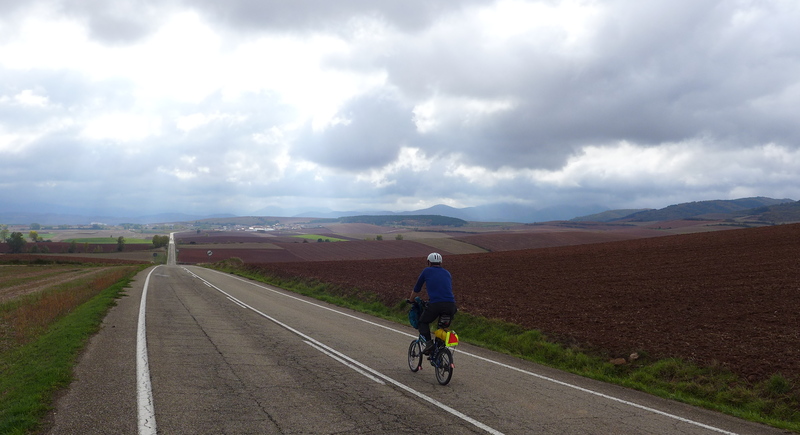 For a lot of the way to Zaragoza I was able to cycle on farm roads through the flat flood plain of the river Elbe. And I cycled through small towns. Zaragoza is a big place. 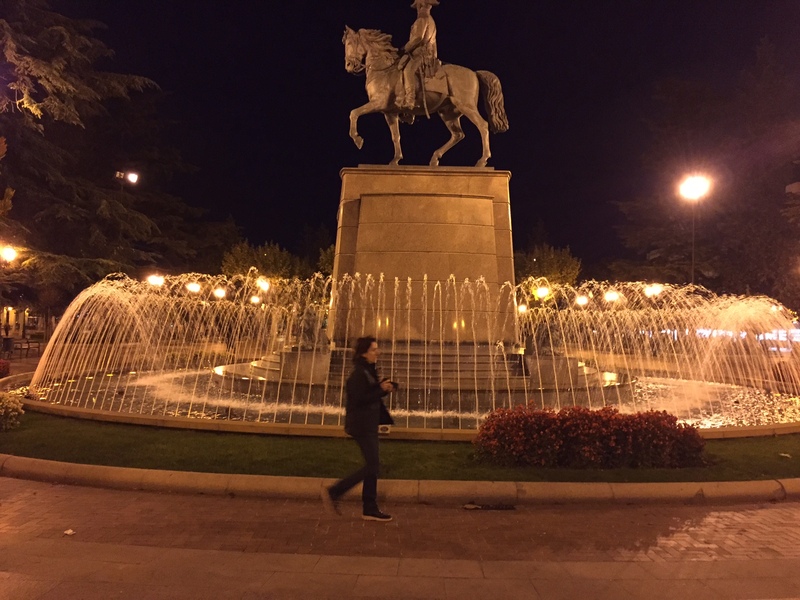 I was advised that it is the least attractive of the major cities of Spain. It is certainly less expensive than Barcelona. 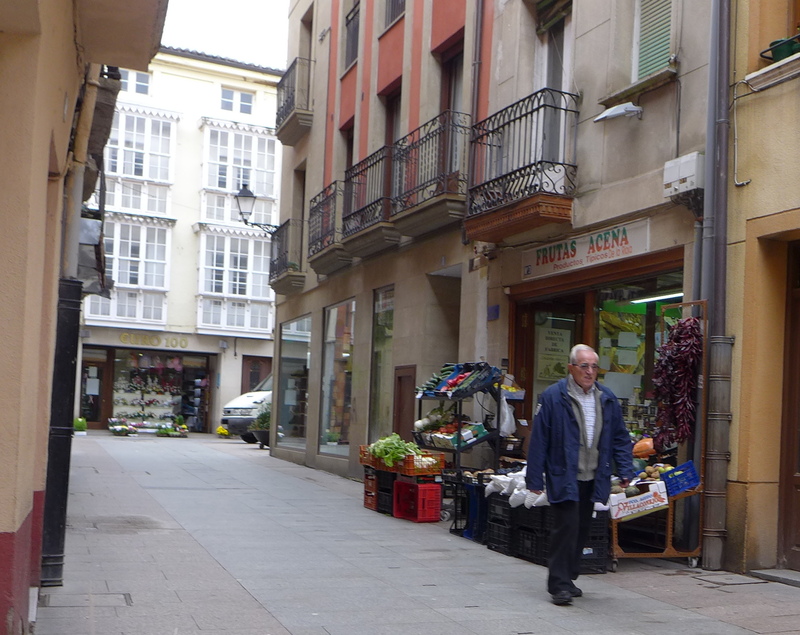 Maybe just because it is Spanish it still has pleasant street life with inner city streets that feel like a room. There are good places to eat, like this tapas bar in central Zaragoza. I stayed there that night, and had time to take a long bike ride the next day through the city and surrounding areas. As I was leaving the center city I saw some type of ceremony involving lots of military brass and civilians who looked almost royal. There were lots of people watching this ceremony and no one seemed to care if a guy pushing a bicycle took pictures of everything. Since Spain has a fascist past I found it all unsettling. As I biked around Zaragoza and vicinity on this final day I saw where the government has made an effort to install bike paths, mostly in newer areas. Like in America, the paths continue until they don’t. I caught a 5:00 PM train for the two hour trip back to Barcelona. While Spain may have overbuilt its infrastructure with debt funded by Germany’s money, it was a pleasure to have public transit systems that work. America is supposed to be this rich country but Spain puts it to shame in this regard. Zaragoza’s relatively new train station felt like the biggest train station I had ever seen. I had a flight taking off from Barcelona airport at 6:45 AM the following morning. I arrived back to Barcelona in time to have a delicious not-that-expensive supper of roast chicken, eaten at the bar of an expensive looking restaurant near my hotel. I was trying to get rid of my Euro, so when my server comped me a glass of local sweet vermouth from a barrel, I gave her a ten Euro tip. I had never even heard of this region before this trip, except for the notation on wine bottles. I guess I assumed Rioja meant red wine. 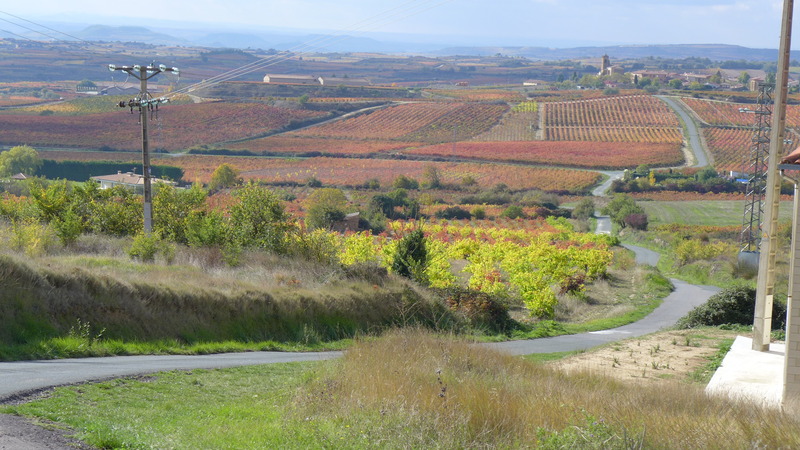 I learned that Rioja on a wine bottle means the wine comes from the Rioja region. And it is a glorious place. 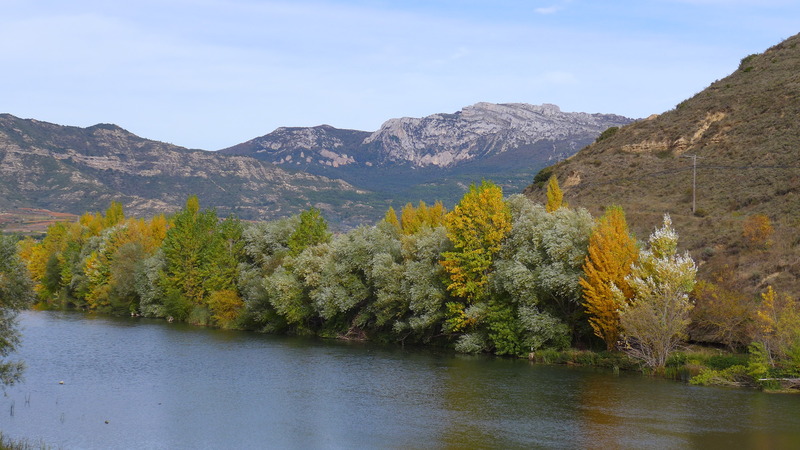 It is essentially a valley between two mountain ranges, centered on the Ebro river; about two hundred miles north of Madrid and about eighty miles south of the north coastal city of Bilbao. The area is covered with vineyards and picturesque small towns. My friend Lyman and I rode around the area for almost a week, making up our route as we went along. 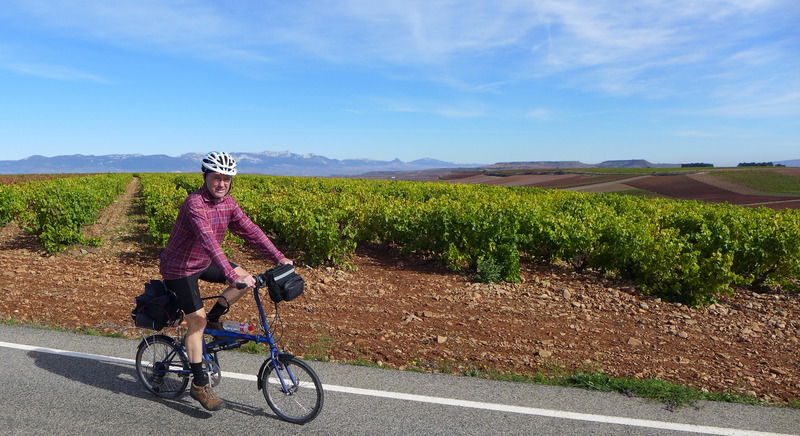 We both had folding bicycles that we had brought with us on the flight to Bilbao airport. 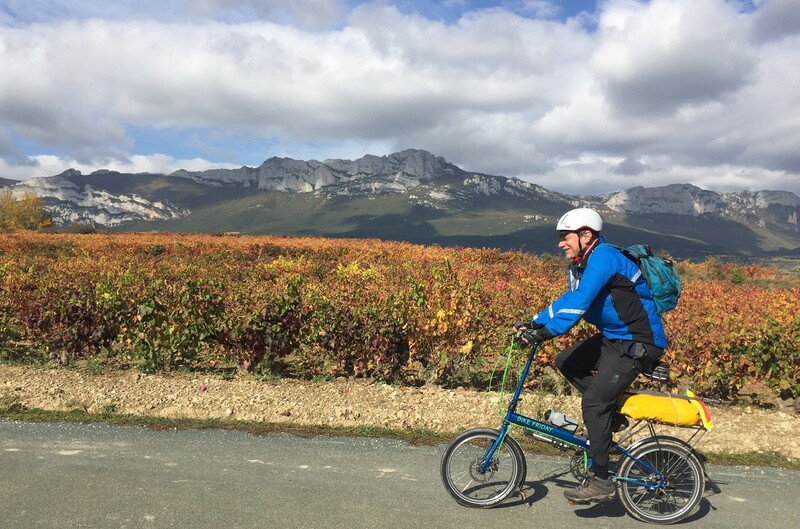 We left the bicycle suitcases at a Bilbao hotel for a week, and bicycles in hand, took the train sixty miles south to Mirando de Ebro, to begin our ride. The valley scenery is indeed beautiful. 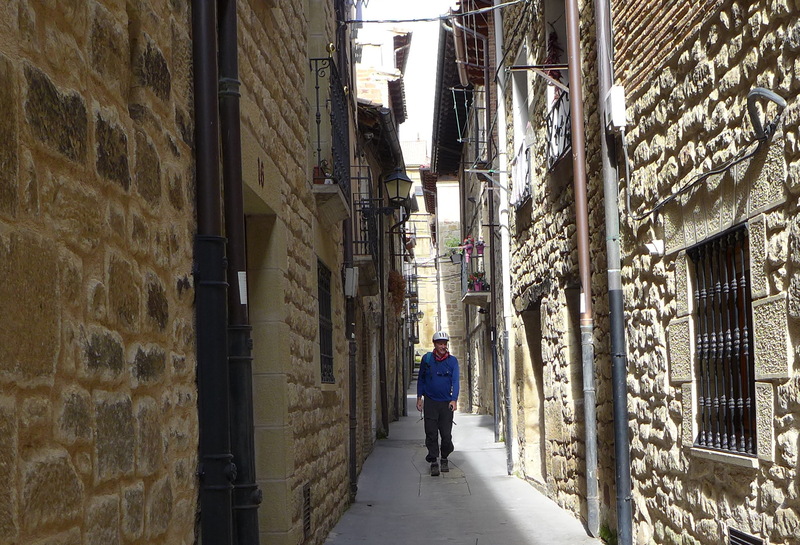 Walking five hundred mile Camino de Santiago has been the thing to do for over a thousand years, and this route cuts across La Rioja. 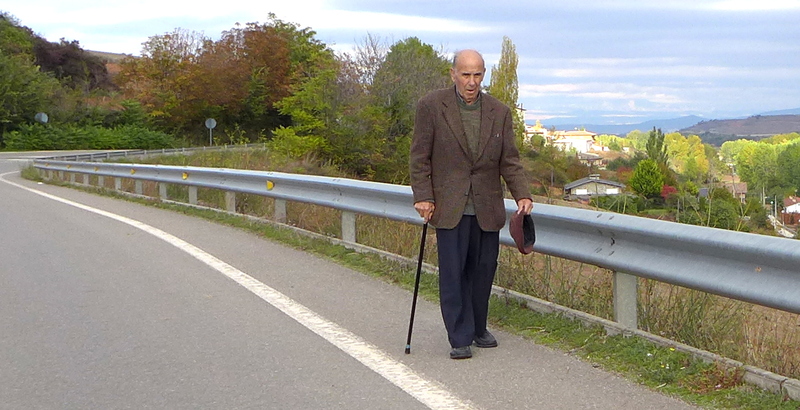 Those who walk are called peregrinos, or pilgrims. Stores, hotels, and museums frequently offer discounts. 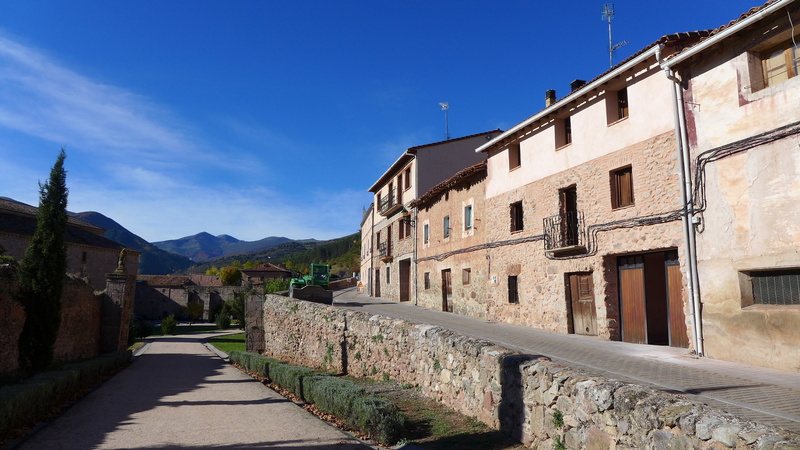 We stayed and walked around in several distinctive towns, such as Santo Domingo de la Calzada, La Guardia, and San Millan. Staying in the religious destination mountain town of San Millan de la Cogolla, there were fewer restaurants than usual, and Lyman and I had a glass of wine in the one bar open in the town, before going back to eat at our hotel. Logroῆo was the largest city we visited, other than Bilbao. It has a population of 153,000. I had never heard of it before this trip. I would speculate that most Spaniards would describe this place as a third tier city in Spain, if that. 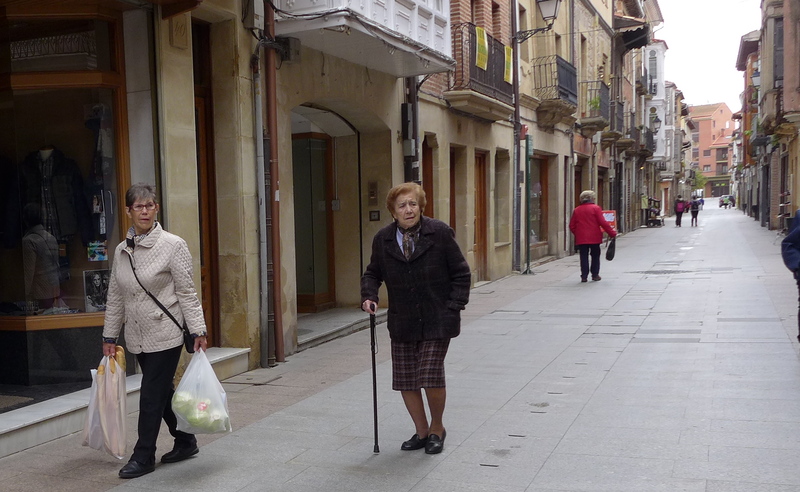 But typically European, Logroῆo has superior urban fabric and street life to almost every city in America. Logroῆo not only has a very dense medieval core, outside of the core it has wide streets with fountains and parks. Logroῆo is famous for it tapas bars. 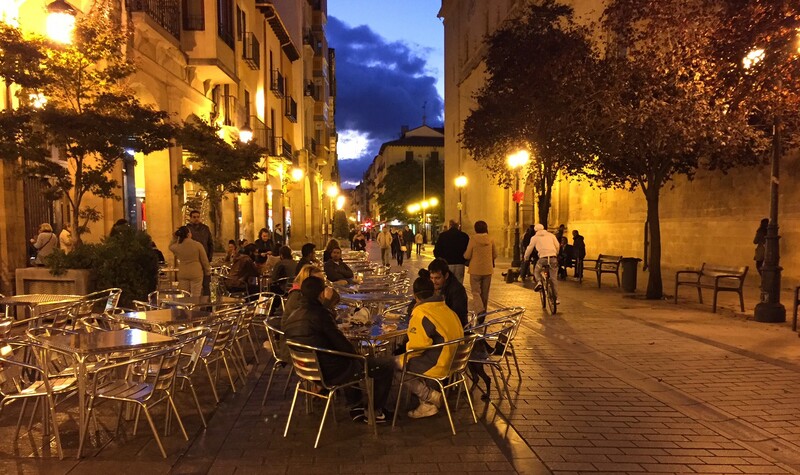 Two downtown streets in particular are famous for the tapas scene. There are supposed to be over fifty tapas bars in a four block area. Many specialize in particular types of tapas. Wine is universally about a dollar a glass. Prices are in Euro, worth about $ 1.15. Lyman and I sometimes had difficulty in staying up late enough for “dinner” at the typical Spanish hour of eleven at night, but in Logroῆo we ate tapas to our hearts content. This one place with a white decor had their white wine prices on a blackboard, and freshly fried chunks of codfish, with olives and bread and fried hot peppers thrown in as part of the deal. Across the narrow street from our pension was this tapas place that specialized in ham. Down the street at Calle Laurel, the tapas bars made the street seem as if it was a room. We were told it was not too crowded, since at this point it was eleven thirty on a chilly Tuesday night. That is Lyman on the far right. Meals in other towns and cities we visited were also delicious. Most restaurants had a complete meal priced at ten to twenty Euro, including two courses, bottle of wine, dessert, tax, and tip. In this place is in the tiny town of Caῆas, we had a twelve Euro lunch, served by a young waitress who looked like the daughter of the older woman doing the cooking. First course was either paella or lentil soup. Second course was porch chops and fries. Dessert was some kind of cake with fruit and whipped cream. The first day in Bilbao we had had an inviting fourteen Euro lunch, sitting next to a rambunctious group of mostly women on a Sunday outing, in an old-school interior whose style certainly has a name. No, I do not otherwise know these people. On our return to Bilbao, we had a delightful lunch with Lydia Egea, her husband, and another friend. She is my friend Esther’s cousin, and I had met her and Esther and friend Nieves thirty -four years ago when they were traveling in Italy. Eating in the old part of Bilbao, we had such great time that we neglected to take any pictures. After a long lunch, we rushed to the Bilbao airport for our evening flight to London, and then home.